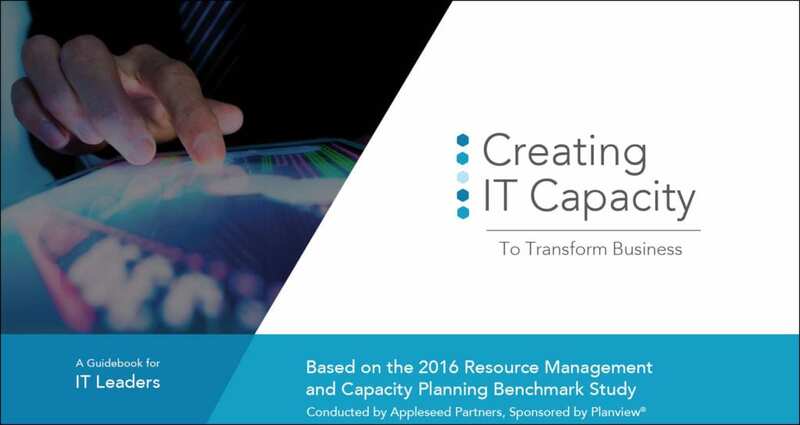 A compelling statistic emerged from the 2016 Resource Management and Capacity Planning benchmark study. Of organizations that considered themselves lower maturity when it comes to capacity planning, only 31% typically even consider capacity when deciding to take on new projects. In stark contrast, 72% of mature companies consider capacity most or all of the time. But what benefits does this latter group gain by having the ability to assess capacity when reviewing incoming demand? As it turns out, there are many positive results to be had from understanding resource capacity. I’ve highlighted 5 key benefits reported by organizations that have incorporated a reasonable understanding of resource capacity into their project intake process. Greater Business Agility – When priorities must shift suddenly to meet an emerging needs, understanding the key roles required and your capacity to fill them allows for more informed tradeoff and scheduling decisions. After all, it’s hard to shift resources around if you don’t have a clear picture of who is available; what their capacity to take on new work is; or what else they’re working on that could perhaps be rescheduled. A Proactive Staffing Strategy – Understanding your organization’s capacity at a role level, as compared with the needs of the demand pipeline, allows you to proactively set a staffing strategy that may include adding skills, hiring contractors, offshoring certain activities, bringing in interns, hiring more staff, or any number of actions that can assure effective execution of organizational strategies. Fewer Firefights and Less Burnout – When your people’s capacity to take on new work is considered and work is scheduled accordingly, the obvious result is fewer firefights, less overload, and more productive, satisfied resources. While change is inevitable, work can be more planful—even emergent work. It’s a simple fact that continued, excessive overtime reduces productivity and increases stress and turnover. To this end, a little bit of planning can go a long way. More Reliable Project Schedules – In today’s dynamic and agile world, project schedules must be fluid and adaptable. But that doesn’t excuse one from planning. On the contrary, planning is necessary even for Agile work, and that includes planning and replanning based on available capacity. This will ensure that the current project schedule is fully capacitized and thus more reliable. In contrast, planning to infinite capacity is like spinning the roulette wheel—if you hit your mark, it’ll be mostly by accident. The Ability to Innovate – Being able to quickly evaluate capacity to take on new innovation projects is crucial. According to the 2016 Resource Management and Capacity Planning Benchmark Study, 71% of IT leaders at higher maturity organizations are able to respond to innovation opportunities in hours or days instead of weeks or months. One participant who successfully undertook capacity planning, a senior manager with a leading consumer products company, reported going from eight weeks to only two or three days on average to evaluate capacity to take on new projects. Indeed, innovation at speed is a clear business advantage. Likewise, the ability to assess capacity to plan for innovation projects in the portfolio is just as vital. It should be clear by now that, collectively, these five major benefits lead to a better customer experience, a more positive work environment, and a greater ability to execute strategies. It is by no means a stretch to add that visibility into capacity is, in fact, a key enabler of agility and innovation—a true differentiator in today’s world.